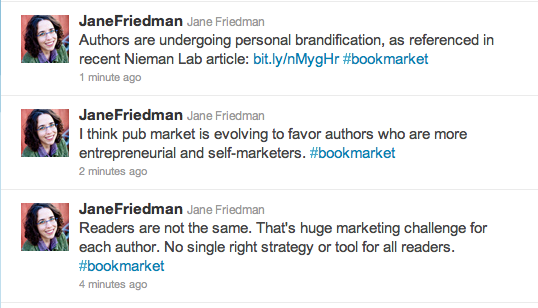 On Twitter yesterday Jane Friedman, Writer’s Digest publisher turned media professor, engaged in an interesting dialogue about how the publishing process is becoming bias to author brands (i.e. authors who can market, publicize and promote their own books). The concept of the author brand has become more important in recent years, and one that is essential for writers entering the book biz to understand. Long gone are the one-size-fits-all marketing plans and grand publicity tours. Now, marketers need to fine-tune their research analytics to find readers that are not only interested in a certain book’s topic and theme, but also optimize online book discovery. (Self-publishing authors must take on this massive role themselves to be successful.) Agents are now using freelance publicists to cross-promote their clients and maximize book coverage. And writers are now expected to help in this entire process. The writer’s job is no longer done when the book is written. Creating an author brand is about having a unique voice, an identifiable attitude, and a platform to express it. From Twitter to personal websites to Good Reads, writers need to be infiltrating their market not with self-serving promotion 24/7, but a style of communicating with their readership that is recognizable and different than other ‘voices’ out there (with the occasional plug for their book). If your voice and brand is memorable, trustworthy, and visible the chances of someone in your social media circle reaching for your book when they see it in the bookstore it much higher than if you had no online or minimal brand presence. The Nieman Lab article Jane Friedman references on Twitter sums it up well: ‘The identity of the author herself — as defined and measured and bolstered by her ability to create a community around her content — is, here, itself a kind of product […] The digital commodification of authorship that takes place by way of community and conversation’. Book culture has always been content driven, but it’s becoming more author driven. The accessible and approachable author, the author that is engaged through the publishing process and consistent in their brand image–a new form of product that commodifies author personalities–enhances the book as a product and is exactly what publishers are looking for from authors today. i believe the writer’s job is only 1/3 done upon completion of a piece Today, more than ever, the author/writer is responsible for promoting and marketing themselves and their product, constantly, honestly and across every possible social, broadcast and written media. The completion for the audience’s attention if fierce . You are right about fierce competition! There are so many ways to read and consume information now: blogs, Twitter, Byliner, publishers, newspapers, websites etc. When building an online platform, what kind of numbers would be needed to define a platform? My twitter account has 12,000 followers, my blog 2,000 hits per week, but it’s difficult to know when you’ve actually built a platform without knowing the thresholds. There are no definitive thresholds to meet. Especially for fiction. Your platform, Twitter and blogging, is where you create your brand and it sounds like you are doing a good job with the numbers you cite. No publisher will pass on offering a book deal if they love the novel, but the fiction author has no platform. Platform in fiction is there to support you when it comes time to sell, market, publicize your work.